This entry was posted on January 27, 2019 by wp_admin. It is not uncommon for folks to ask for a custom helmet look that can't be done in vinyl but needs to be done with paint. Ms. Strawn is a fantastic artist, but everyone knows her and not everyone can wait the 1-2 month that she is booked up. And different artists have different styles. Vincent van Gogh amazed the world. There was still room for Pablo Picasso. How much detail can I have? 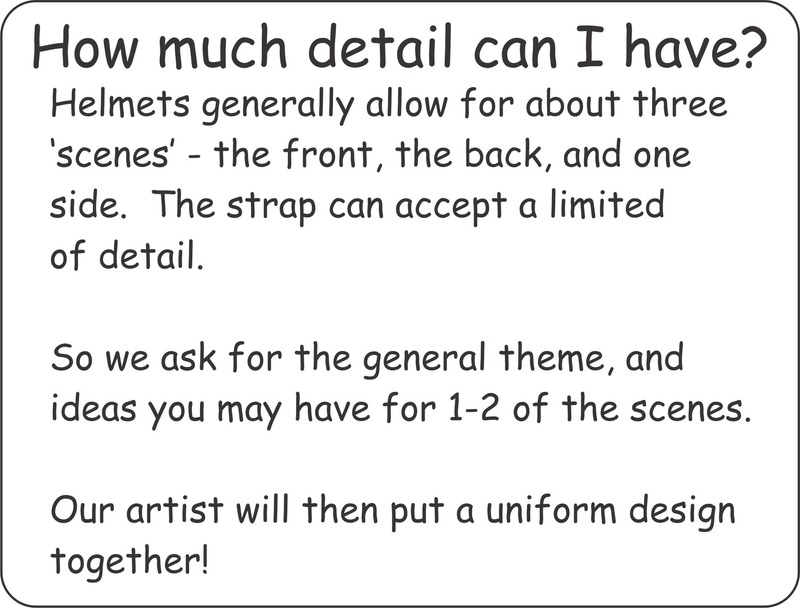 Bling Your Band has partnered with an experienced artist to offer helmet painting! The way it works is we will ask you to pick the helmet theme - say vintage explorer, or flowers, or fixing my melon, or a new design. Tell us if the helmet is a for a boy or a girl, and you are free to pick a secondary theme. It might be a Disney character, or your favorite team, or something meaningful to your family. And then (optionally) pick 1-2 specific elements. Maybe dog tags, a specific character, a message to the world, a specific logo, or a particular event. Last, feel free to share some details and your ideas for the design with the artist. Once you place the order, the artist will see all these details and will talk to you to be confident that she has captured your vision. The artist needs a full day with the helmet and can ship it out the end of that day. Part of the fee includes Priority Mail shipping. Yes the helmet company asks that your child wear the helmet 23 hours per day - painting the helmet will delay the start of the treatment by 4-5 days, but the helmet treatment will simply extend 4-5 days longer than it would have. Plagiocephaly treatment can seem like an emergency to get started, but it is a long term process. Once you start with a band, you will soon see that it is worth having a band that you are proud off and makes your experience better at the cost of delaying the treatment by less than a week. 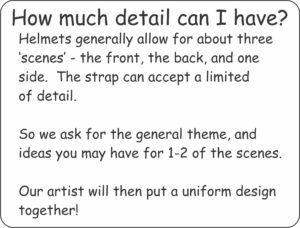 Our artist had a child with a band, she can talk to you about this if you are still concerned about time needed to paint and ship the band. Once the helmet is returned to you, you will continue to clean the inside as normal, wiping it out with a cloth dampened with rubbing alcohol. The outside of the band at most needs wiped with a wet washcloth. No routine maintenance is needed.